BMW X3 2011, 2012, 2013, 2014, 2015, 2016, 2017, Over OEM Kit, Full Interior Kit, 67 Pcs. BMW X3 2004, 2005, 2006, 2007, 2008, 2009, 2010, With Automatic Climate Control, Full Interior Kit, 64 Pcs. BMW X3 2004, 2005, 2006, 2007, 2008, 2009, 2010, With Manual Climate Control, Full Interior Kit, 60 Pcs. BMW X3 2011, 2012, 2013, 2014, 2015, 2016, 2017, Basic Interior Kit, 46 Pcs. BMW X3 2004, 2005, 2006, 2007, 2008, 2009, 2010, With Manual Climate Control, Basic Interior Kit, 34 Pcs. 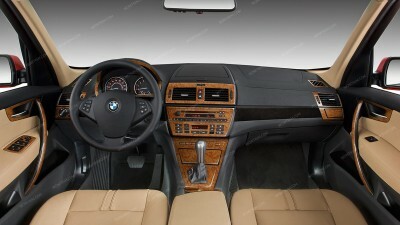 BMW X3 2004, 2005, 2006, 2007, 2008, 2009, 2010, With Automatic Climate Control, Basic Interior Kit, 34 Pcs. BMW X3 2011, 2012, 2013, 2014, 2015, 2016, 2017, Exterior Kit, Full Interior Kit, 20 Pcs. BMW X3 2004, 2005, 2006, 2007, 2008, 2009, 2010, Stainless Steel Pillar Posts, 10 Pcs. BMW X3 2004, 2005, 2006, 2007, 2008, 2009, 2010, Exterior Kit, 11 Pcs. BMW X3 (F25) 2011, 2012, 2013, 2014, 2015, 2016, 2017, Stainless Steel Pillar Posts, 10 Pcs. BMW X3 2011, 2012, 2013, 2014, 2015, 2016, 2017, Basic Exterior Kit, 10 Pcs. BMW X3 2011, 2012, 2013, 2014, 2015, 2016, 2017, Optional Overhead Console Interior Kit, 13 Pcs. BMW X3 2004, 2005, 2006, 2007, 2008, 2009, 2010, Stainless Steel Pillar Posts, 4 Pcs. BMW X3 2004, 2005, 2006, 2007, 2008, 2009, 2010, Exterior Kit, Optional "X3" Gas Tank Lettering Insert, 2 Pcs.